Aurora is the second largest city in Illinois with a population of 180,000. The district has 1,300 staff and serves over 14,000 students spanning 2 early childhood centers, twelve elementary schools, three middle, a magnet academy and one high school. The district had never had an intranet before and information was not centrally managed. 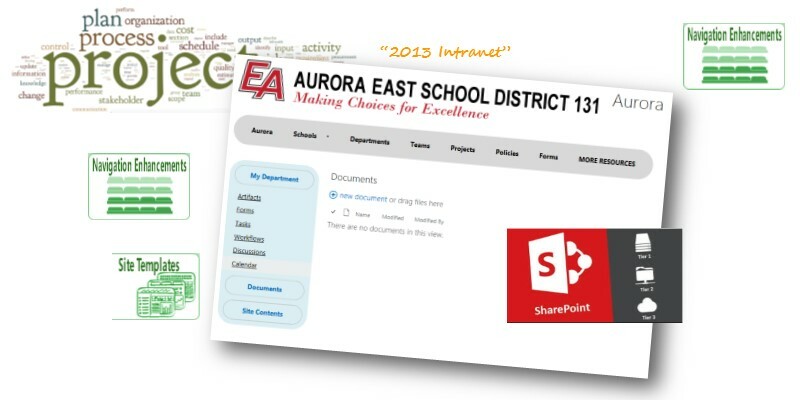 SharePoint was a new technology for Aurora and knowledge transfer to their IT staff was essential. The requirements for this was that it would be an easy to manage intranet and user training and support would be minimal. Otherwise, it would've easily exceeded the demands of the support infrastructure. Working very closely with their administrator Rehman Ali, we built a SharePoint 2013 on-premises system. This system was highly dependent on well-designed taxonomy as it used a large degree of managed metadata to organize content via search aggregation and to personalize content for each authenticated user. This allowed each user to see just what they needed to see in terms of their tasks, their teams, their calendar dates and presented it in a very friendly manner. This seemingly simple user interface was carefully constructed using SharePoint 2013 search engine to aggregate content and expose it to the homepage based on security audience. The portal was deliberately designed to be a useful tool by showing the logged on user - their calendar, their tasks, and news of their area. The user interfaces itself was kept exceedingly simple with neutral colors for a base platform and allowed for some personalization throughout the subsites hierarchy. Aurora has moved a great deal closer to achieving their goal of creating a centralized system for management of the disparity of information and its ongoing success is ensured by a well-designed SharePoint farm. As a Microsoft Gold partner specializing in Microsoft SharePoint consulting services we know how important a friendly SharePoint branding is to speed adoption and to making a good user experience for your company. Please contact us to see some of the SharePoint branding services that we provided for other companies and how will we can help yours.